The holiday season can be so much fun, but it is also a stressful time of year. There seems to be more of everything to do – shopping, cleaning, cooking, and baking. If you plan to host family or friends during the holidays, the work load is even greater. You want to enjoy your time with guests and soak up the atmosphere; not just get caught up in the work. Planning and preparation take some of the stress out of the holidays, particularly when it comes to big family meals or holiday parties. Make a list, get your shopping done in plenty of time, and do as much food preparation in advance as possible. Once the big event arrives, remember that your guests are there to socialize with you and not just to be fed festive treats from your kitchen. One way to make sure you are part of the social action while still getting everything ready, is by using your kitchen island. 1. 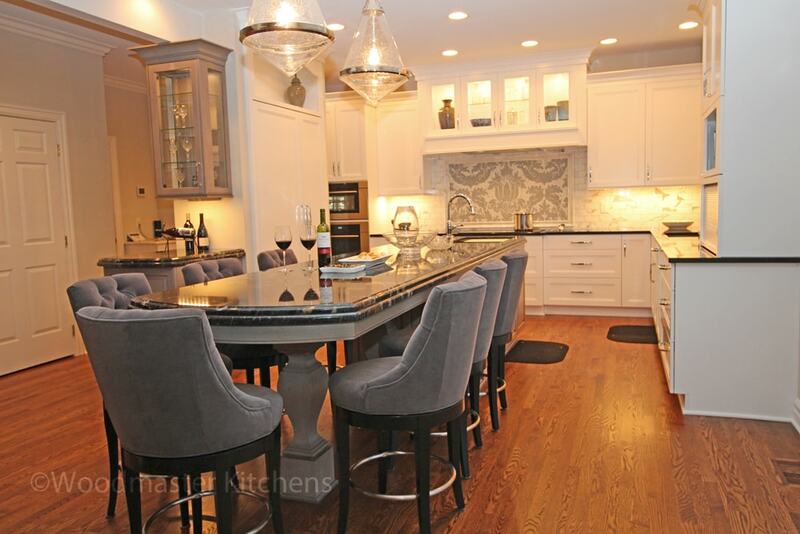 Use the island as your staging area to prepare and plate up dishes, just like a real professional kitchen! As you prepare food, you can set out dishes on the island and artistically arrange the food, while your guests look on from the other side of the island. A Galley Workstation is the ideal solution to turn your island into a master chef worthy focal point of your kitchen design. 2. Add seating at the island so guests can sit and enjoy a beverage while talking to you. You are able to carry on with the work and even serve appetizers across the island to guests, as you prepare them. 3. Island kitchen cabinets are the ideal place to store special items you need to access during the holidays, like baking supplies and festive table linens. 4. Install an undercounter refrigerator in the island to allow guests to top up their wine or access a soft drink without disturbing your cooking. 5. For informal dining or eggnog with a few friends, use your island as a casual dining destination. Put in the planning ahead of your holiday events so you can relax and enjoy time with your guests. Our kitchen renovation gallery has more great ideas for kitchen island designs, or contact us to start planning your 2018 kitchen remodel!